Bollywood star couple Kareena Kapoor Khan and Saif Ali Khan were blessed with a baby boy on Monday, and soon the name was trending online. Just hours after his birth, Taimur got his own Instagram page and a few hundred followers too. Here's a glimpse of his fame. Star Kids are predominantly human, but not entirely. They are human, but different. You need to have a good fortune to be born as a star kid, especially in a Bollywood family in India. The fans of the Bollywood couple parents make their kids star on the day they are born. But, it's like one step ahead for Taimur - the baby boy of Saif Ali Khan Pataudi and Kareena Kapoor Khan. Bollywood star couple Kareena Kapoor Khan and Saif Ali Khan were blessed with a baby boy on Monday, and soon the name was trending online. 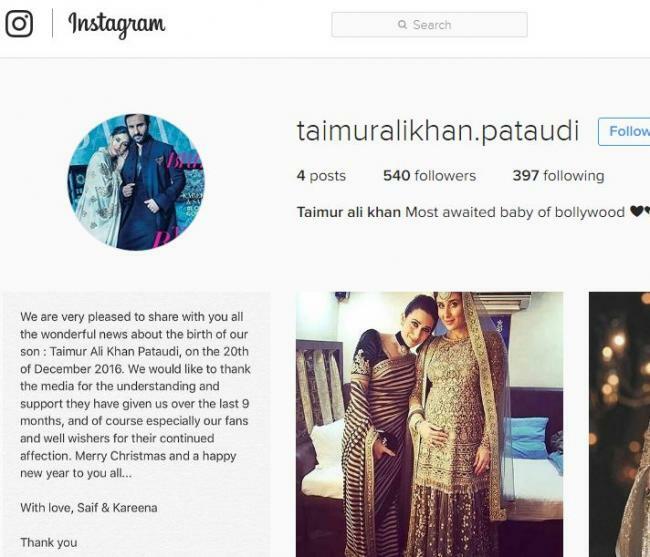 Just hours after his birth, Taimur got his own Instagram page and a few hundred followers too. "We are very pleased to share with you all the wonderful news about the birth of our son: Taimur Ali Khan Pataudi, on the 20th of December 2016. We would like to thank the media for the understanding and support they have given us over the last 9 months, and of course especially our fans and well wishers for their continued affection," Saif and Kareena said in a statement after the birth of their baby boy on Monday. It was filmmaker Karan Johar who broke the name of Saifeena's firstborn on Twitter. And since then, there's been no stopping about the thrill and amusement that flows on the social media. My Bebo had a baby boy!!!!!!! Am so so happy!!!!!!! #TaimurAliKhan ?????????? Twitterati started posting their tweets on the choice of the name of Saifeena's baby boy, and with more than 22,000 tweets (till 7.30pm on Dec 20), Taimur's name started trending in Top India trends on Twitter. Taimur is a Turkish word, which means iron. However, in the pages of history the name has a special mention. Taimur or Timur was a Mongol conqueror of Central Asia. The conqueror referred to himself the 'Sword of Islam' and wanted to purify the human race. So apparently the name 'Taimur' means strong and brave. #NotThatItsAnyOfMyBusiness #justsaying Welcome to twitter #Taimur Already trending!